It turns out 22-foot long, 10-foot deep tunnel that 131 Mexican prisoners supposedly used to break out of jail on Monday was all a sham ... perpetrated by the prison guards who let them walk out through the front door. It turns out 22-foot long, 10-foot deep tunnel that 131 Mexican prisoners supposedly used to break out of jail on Monday was all a sham ... perpetrated by the prison guards who let them walk out through the front door. Three prisoners in Monday's jailbreak in Piedras Negras, Mexico have been captured and revealed that their escape was actually mundane: it was aided by prison guards who were bribed by the Zetas drug cartel. "There was total complicity, collusion and betrayal from the officers charged with preventing them from escaping," said the public security secretary of Coahuila Jorge Luis Moran according to the BBC. On Monday, those "officers charged with preventing them from escaping" told journalists this tall tale of their prisoners escaping through a shabby looking tunnel, when in reality, as CNN's Marilia Brochetto reports, Mexican officials found that those inmates literally used the prison's front door. "Authorities arrested 16 employees, including the prison director, after the escape," Brochetto reports. 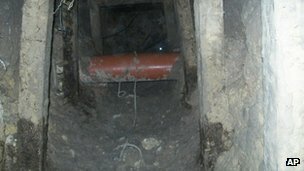 There's no word yet on whether it was the prisoners or the guards who dug the just-for-show tunnel, but Mexican officials (who presumably aren't of the bribing variety) say the Zetas drug cartel was behind the massive jailbreak.